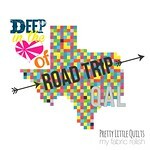 I am back from QuiltCon and it was so much fun! I know so many of you didnt get to go but it was so great meeting so many friends, new and old! I got to have this whole experience with my friend, Alyce Blyth from Blossom Heart Quilts, and I wouldn't have wanted it any other way. We have been following each others blogs for the last couple of years and finally met in person. She stayed a couple of days at my home with my family then we drove down to Austin together and stayed with one of my dear friends. It was nice having that one person to check in with! 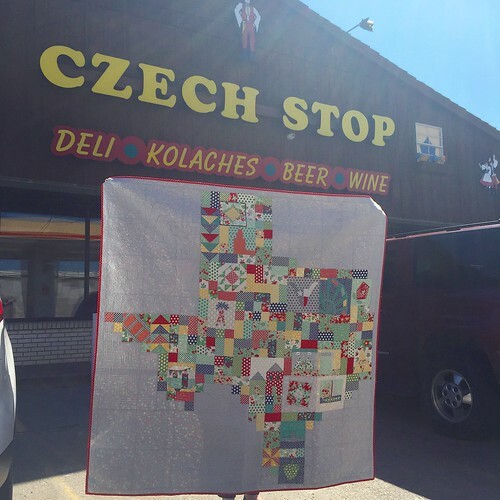 I did manage to get one picture of Flat Texas at the Czech Stop in West and I had hoped to get one in front of the Capitol but never managed to get down there. We will drive through in April and will try again. 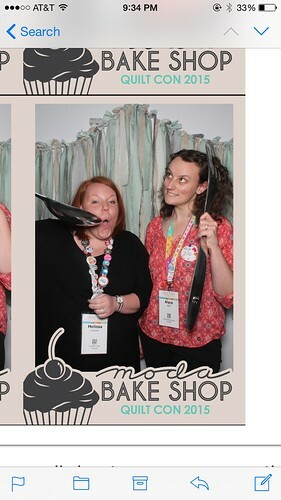 And I loved the photo booth in the Moda booth! I think I left my actual printed picture in the printer but here is a screenshot. I'm pretty sure most of you were glued to IG looking at all the lovely quilts and there is a hashtag just for quilt viewing (#quiltsofquiltcon). 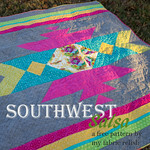 You can also see all of the winners on The Modern Quilt Guild's website as well. This is just a small group of awesomeness that was to be seen so please don't just stop at the winners. I probably won't get to make it to Pasadena but already planning for Savannah! We've had a bit of ugly weather the last three days and I've been home with the girls since school was cancelled. Boo! On a super positive note, I've gotten lots of extra snuggles in and I'm so glad since I am leaving again tomorrow for QuiltBLISS! I. CAN'T. WAIT. Oh, and guess who gets to fly first class? ME! It is my first time ever and since I wanted to check two bags, it was going to be same price as coach. Absolutely absurd but I sure feel fancy! I am all packed and decided to take my Featherweight 221 to sew on and have three different quilts to work on and then my class with Camille Roskelly. I am most excited about taking a fabric dying class the day I get there. I will try to take lots of pictures and post them on IG so be sure to visit me there! But before I am off again on my next adventure, I wanted to share something with y'all and wanted to make it sort of a pep-talk as well. So, if this post gets sort of long, please forgive me but don't give up on me! 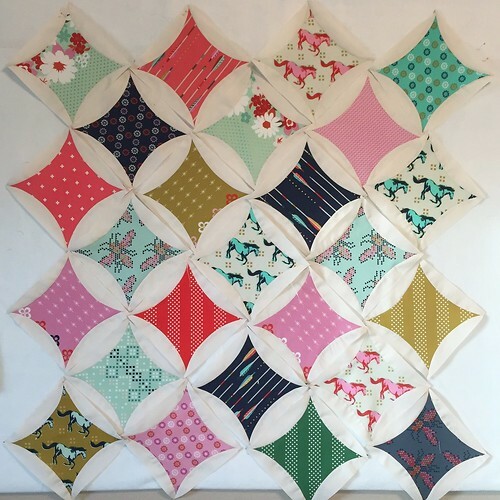 I realized a lot about myself and quilting the past couple of weeks and it was compounded when I attended Angela Walter's How to be a Better Quilter lecture at QuiltCon. This lecture was only 35 mins or so long but it was impactful (and funny!). So much so and not just to me, that Angela released a video just this morning about her three important rules to quilting. You can watch it here and it's really quick and you might cry at the end. Go watch and come back. So back to why I am sharing this video: I shared a picture of a quilt that I was working on on IG a few weeks ago and it was just blocks arranged on my design wall. 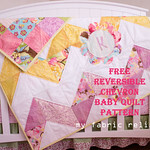 The quilt pattern came from a tutorial by Cristina at Pretty Little Quilts using the QuickCurve ruler. It was my first time using the ruler and sewing curves and knew I would need a bit of a learning curve (hehe no pun). The blocks went together fairly simple. The curves weren't as hard as I feared and I was so please with how they looked on the design wall. All my IG peeps seemed to like it too and was feeling pretty confindant. You know how it goes, right? So it was time to trim them up and piece them together and that is were things took a turn. I could not get them to trim down all to the same size and literally put them in the scrap bin three, THREE, times! I then went and sat on the couch with Mr. Relish and told him my plight and showed him my picture of the design wall and just like all the others on IG, he said it looked great. So I went back in the sewing room and trimmed them the best I could and then pieced them together and this is was what I got....a bubbly, wonky mess with points not matching (it's hard to see in the picture but TRUST ME). Humph! It hung there for a week or two while the longarm sat empty and I just couldn't bring myself to waste time even quilting it, but since I had purchased the QuickCurve Sidekick long arm ruler specifically to quilt it I decided it was a perfect crappy quilt to practice the ruler on. 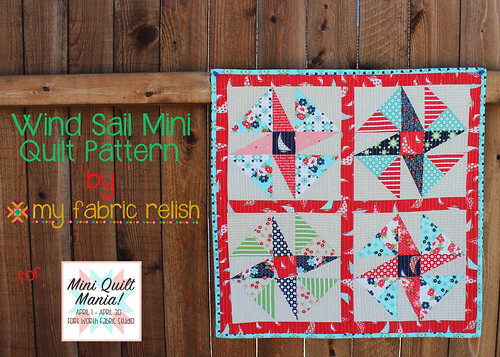 And guess what I learned...."A finished quilt is better than a perfect quilt top!" - Angela Walters (now is the time to watch the video if you skipped that step ;). My quilt is no longer wavy and wonky, my points magically lined up and all the flaws I hated from the quilt top were no longer noticeable because I quilted the crap out of it and had so much fun doing it! 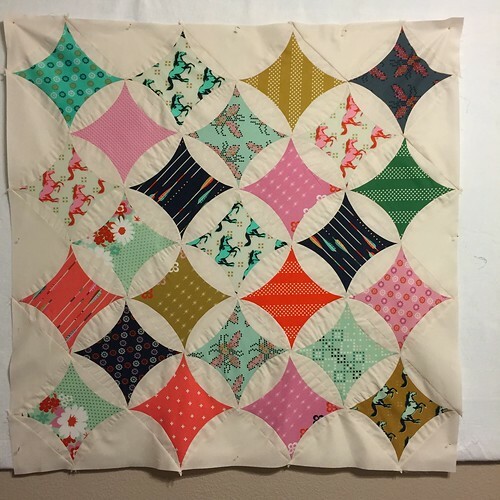 So, if you hate an imperfect quilt top and have no desire to finish it, then I hope this will motivate you to at least try and you might be surprised with the outcome. I know I was! 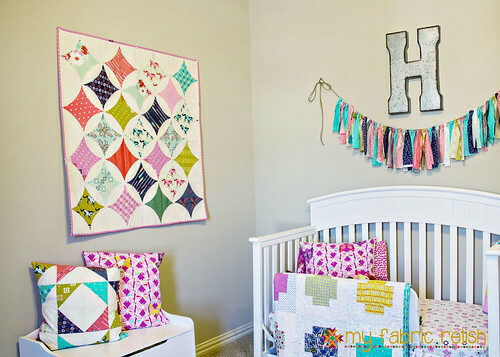 This quilt is now hanging in little relish's room and it makes me smile everytime I look at it and it makes my baby girl happy to know that mommy made something just for her to put in her room. 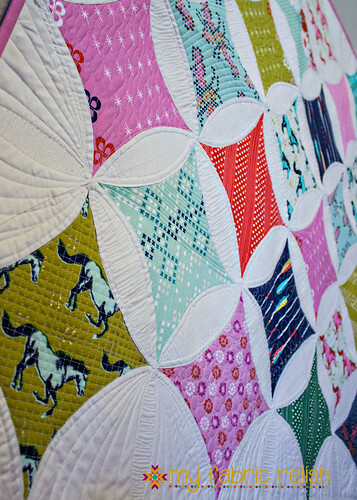 Your quilt is stunning and that's a very good point to finish first!! I absolutely love it!! It looks fantastic. 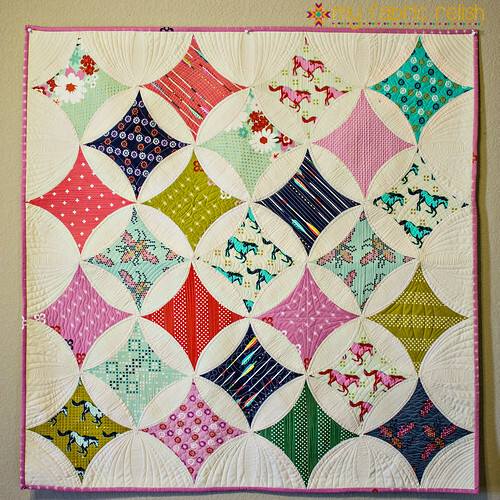 I'm convinced that something magical happens when you quilt a quilt, it can somehow transform something from blah to fab, its happened to me and it sure looks like it happened here! Thanks so much for sharing Angeka's video. 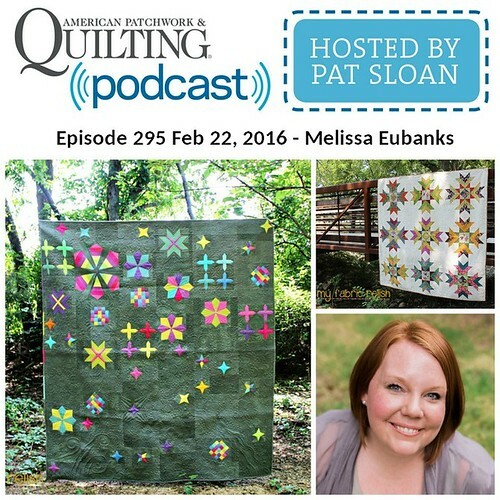 I am new to quilting and I have been guilty of all 3 things she discussed. Now I can finish my quilt and proudly hand it over to the first time mommy I made this quilt for. I know that she will wrap her baby girl in it and won't see my mistakes...only the love and prayers I poured into it. A wonderful post! Thank you for sharing Angela's video and your lesson learned! Wow! 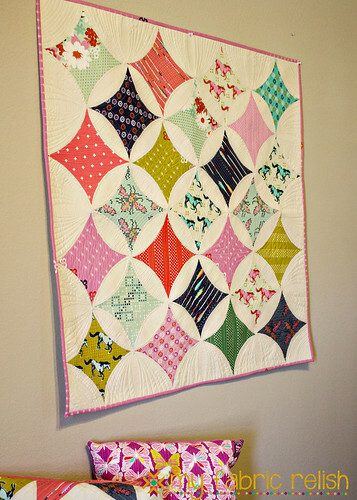 Your quilting really transformed it! It came out really stunning! I wish I had bumped into you! I was a bit overwhelmed and lost at some points. 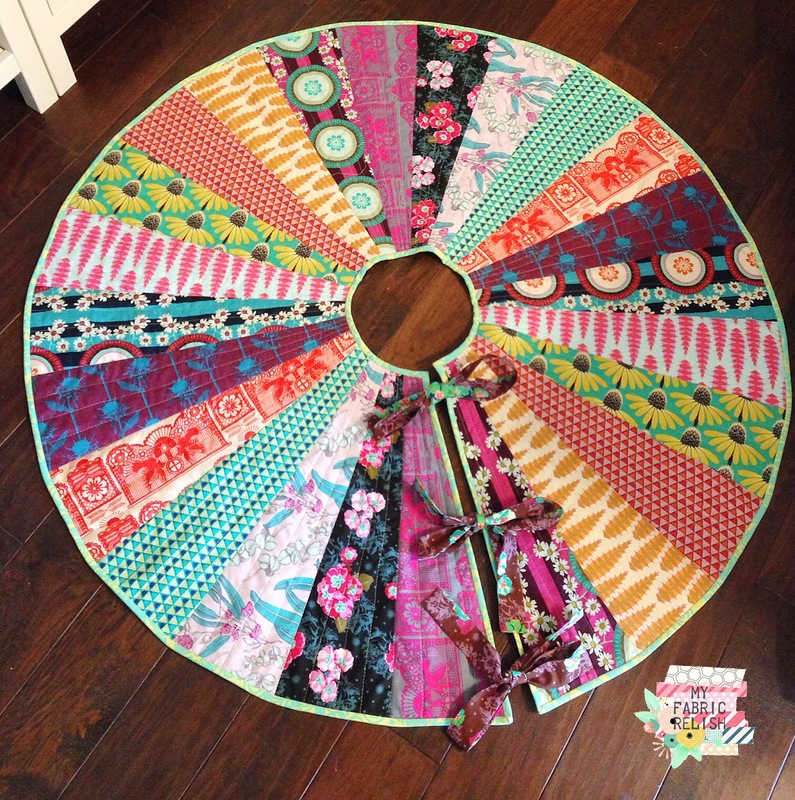 You quilter that into awesomeness!!!! So fun meeting you at QuilCon! 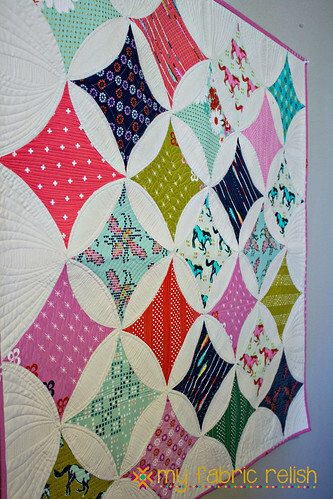 Love love love this quilt:) I think it looks great too. Fabulous job.